Accurate Medical Diagnostic Center (ACCUMED), Inc.
First Lab started its operations on March 4, 2012. It is open Monday through Saturday from 6:30am - 3:00pm. AccuMed HMO Clinics are located at the 2nd floor of Angeles & Mabalacat branches. Accu-Renal started its operations on February 6, 2010. It is open Monday through Saturday from 7 am to 6 pm. 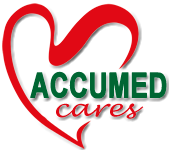 Accurate Medical Diagnostic Center, Inc.
AccuMed was established on October 18, 1993 with the primary purpose of providing medical diagnostic procedures and other related services such as Laboratory Examinations, X-ray, Electrocardiogram, 2D Echocardiography and General Ultrasound. Fill-up the electronic form to obtain an appointment for the selected imaging procedures and home service for blood extraction. The HbA1c test is also used to diagnose diabetes. People with diabetes need this test regularly to monitor if their levels are staying within range, to know if they need to adjust their diabetes medicines. Â© 2016 Accurate Medical Diagnostic Center, Inc.